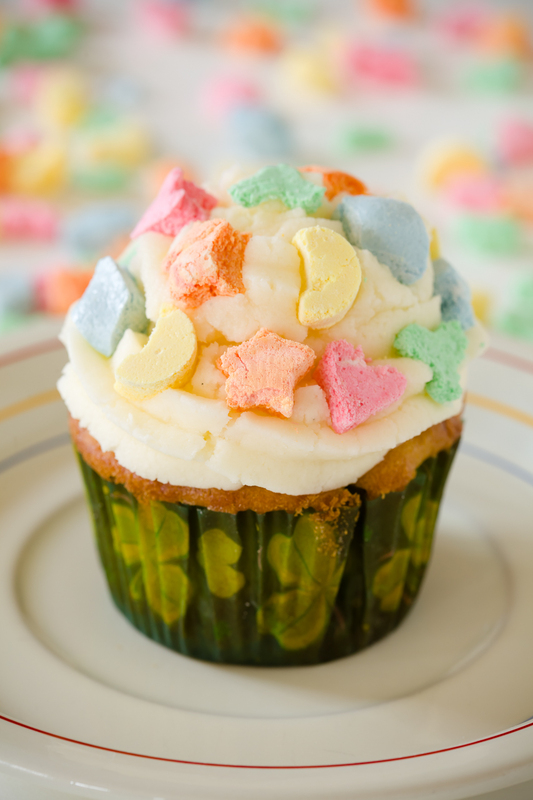 Lucky Charms cupcakes feature a triple dose of luck: a Lucky Charms crust, Lucky Charms mixed into the cupcake batter, and Lucky Charms marshmallows on the frosting. The pure sugar of the Lucky Charms cereal balances with a not-so-sweet cupcake to create a combination that is magically delicious and enjoyable for kids, adults, and leprechauns alike. One glance at the photo will probably reveal that I made my Lucky Charms cupcakes with homemade Lucky Charms. 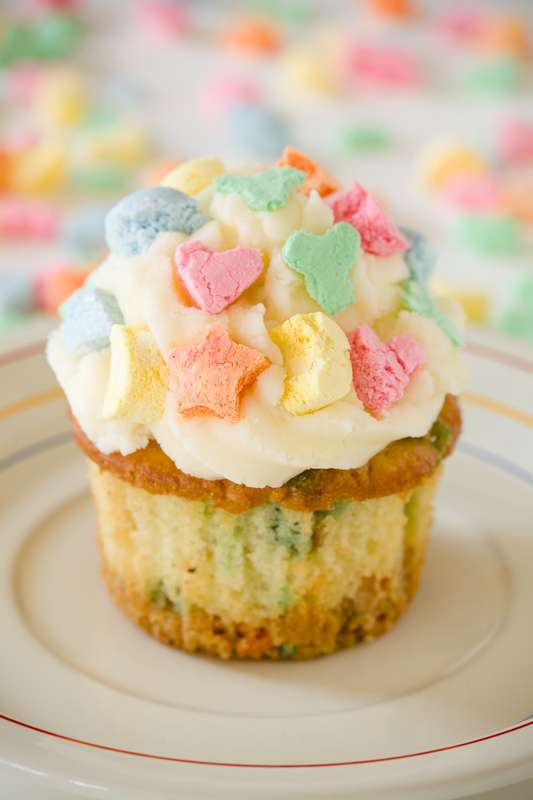 However, Lucky Charms cupcakes can just as easily be made with store-bought Lucky Charms. Both the cake and the frosting are made using homemade corn syrup. Homemade corn syrup is NOT the same thing as store-bought corn syrup. Instead, it is a sugar syrup that has been flavored with corn. The corn flavor imparts a cereal taste to the cupcake and gives the frosting the aftertaste of sweetened cereal bits that have been left over at the bottom of a bowl of milk. 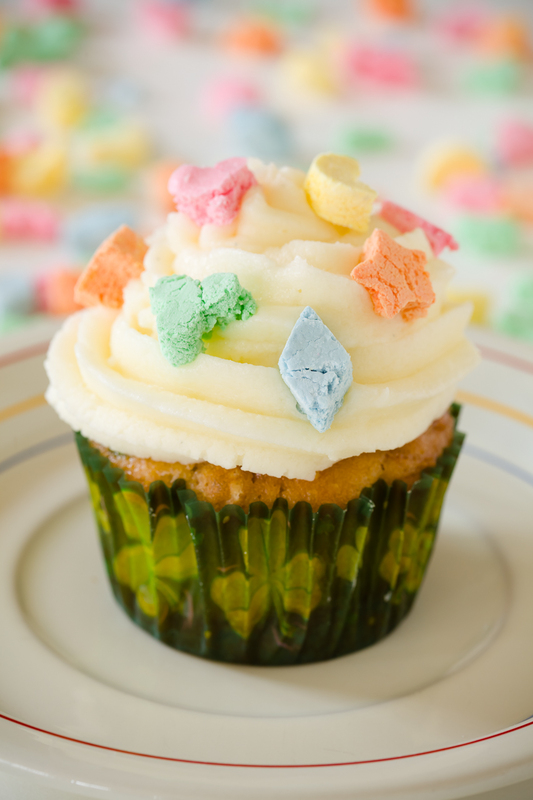 If you plan on making these Lucky Charms cupcakes, I highly recommend that you take the time to make homemade corn syrup. If that’s not possible, you can still make the Lucky Charms crust (recipe below), but instead of using this cupcake recipe, use a vanilla cupcake recipe (with 1 cup of Lucky Charms mixed into it), and a vanilla frosting. 2 cups crushed Lucky Charms I used my mini food processor to crush them. In a small bowl, mix together crushed Lucky Charms and melted butter. Divide mixture evenly between ten cupcake liners. Pack it firmly into the bottoms of the liners. In a medium-sized mixing bowl or bowl of a stand mixer, mix together corn syrup, sugar, cake flour, baking powder, baking soda, and salt. In a small mixing bowl, whisk together egg, sour cream, and oil until smooth. Spoon cupcake batter over pre-baked crusts. The batter should come all the way to the top of the liners. Mix butter on high speed for three minutes until light and fluffy. Mix in corn syrup until just combined. Top with Lucky Charms marshmallows. I thought that these cupcakes looked like little toadstools for leprechauns. However, there has been an important debate taking place on the Cupcake Project Facebook page about whether or not leprechauns are small enough to sit on toadstools. Head over to the Facebook page to weigh in. Very cool! Looks so pretty too. Ok I know I am gonna sound like an old lady when I say this, but your new font is so hard to read! Very pretty, but so tricky, especially on my iPhone! Any way you’d just keep it for captions or headings and not the whole body copy? :) good work with all those homemade mallows by the way! Sounds like quite the project…. Erica – You are the second person that has said that to me. I haven’t changed the font and it looks fine on my screen. Any chance you could email me a screen shot so I could see what you are talking about? stef@cupcakeproject.com. I would really it! Someone else sent me a screenshot and we fixed it. Thanks so much for altering me to the problem! I am not sure how soon I will be making my own mini marshmallows but I totally love these! how cute! you always amaze me with your work, very impressive looks so nice ! Oooo, these look sooo good. I feel the need to lick the screen but that’s not going to satisfy my need for lucky charm cupcakes. 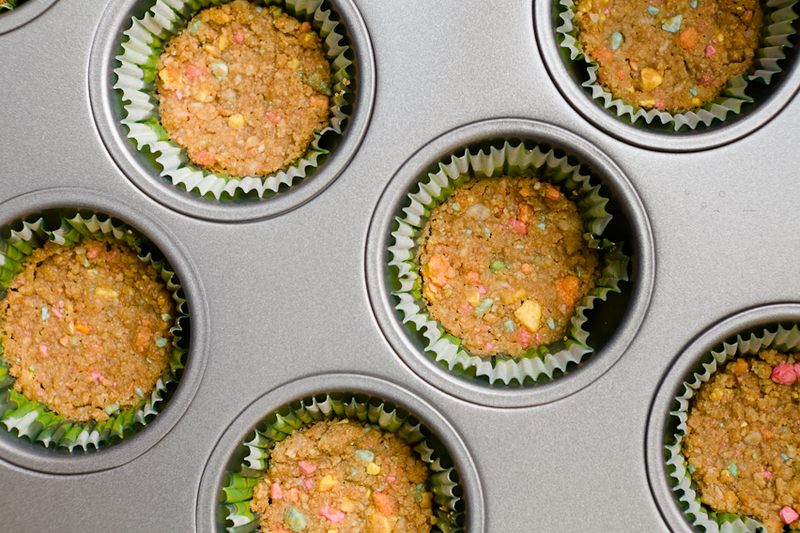 Do you imagine that these could somehow be turned into cheesecake cupcakes with a magically delicious lucky charms crust? Most definitely! That would be fantastic! Do the lucky charms in the cupcake include the cereal, or just the marshmallows? They include the cereal, but you could do it either way. these are perfect for st patty’s day! super cute and creative! What a cute and sweet idea. The colorful Lucky Charms are perfect. That is so beautiful! I love the colors combinations! is there anything you could replace the corn syrup with? I made these cupcakes last night and they turned out AWESOME!!! They made 12 cupcakes instead of the 10 that the recipe says, which is even better :) I put some green food coloring in the frosting and printed out some cool shamrock cupcake wrappers for St. Patrick’s day to place them in. I wish I had a camera so I could take a picture. Thanks for the great recipe! Just started blogging and this recipe was one of my first posts!! Thanks for the creative and delicious idea!